So I know we still have some territory to cover here and some more hyperlinks to add but lets take a timeout and just address what these downloads mean. So it’s clear that WooCommerce is popular in terms of downloads but how does that translate to actual people or sites using WooCommerce? Well following our 1 million downloads celebration we were introduced to this pretty amazing tool called builtwith.com that began tracking WooCommerce sites. For the first time we could quantify the widespread usage of WooCommerce and identify sites using WooCommerce. At that time we were blown away by the 47,217 sites using WooCommerce and were even more thrilled to be able to begin to track actual WooCommerce growth and explore the myriad of sites across the globe. So back to the downloads and sites! Who wants to guess how long it took to go from 1 million to 2 million? If you guessed five months you win a high five. Yeah, just five months to jump another million and perhaps even more exciting the growth of sites went from 47,217 in June to 154,463 sites or 9% of ecommerce sites globally. I guess there is something about five months because we hit 3 million five months later in April 2014 and by that time builtwith.com released new stats revealing WooCommerce as the largest ecommerce platform in the world in terms of total sites . Along with these mind blowing numbers we released a blog post digging into the data a bit more. Since that time further builtwith.com data put total WooCommerce sites at 259,386 sites in April 2014 and just last week new data was released putting WooCommerce sites at 381,187 sites or 17.77% of ecommerce sites online. 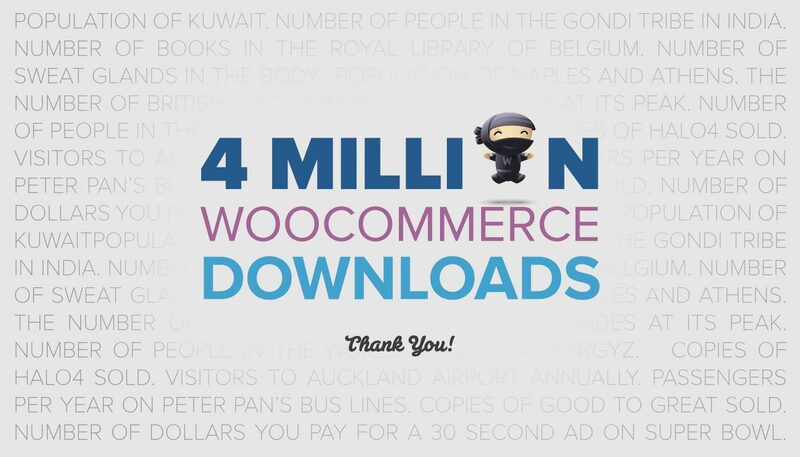 Now, without further delay, drumroll….. WooCommerce has now been downloaded 4 million times! While growth and numbers are positive things, we still get excited for the one. A creative site, an empowered DIYer, a dev taking on a new project, a really unique ecommerce shop using WooCommerce or another support ticket resolved – we never want to lose sight of how linked our success is to each of you. Thank you for choosing us and believing in us. WooCommerce Conference in November is going to be a special time for us to engage with customers and developers and to celebrate perhaps a more significant milestone – the WooComm community coming together from around the world for the very first time! Until then, happy 4 million. P.S Did you hear we’re giving away a Golden Ticket, including flights and accommodation? Find out how to win it here.